HadAT is the Hadley Centre's radiosonde temperature product. This website contains a full audit trail of all the decisions made in the construction of HadAT, a range of fully gridded and globally / regionally averaged products on a monthly or seasonal resolution, and some frequently used graphics. 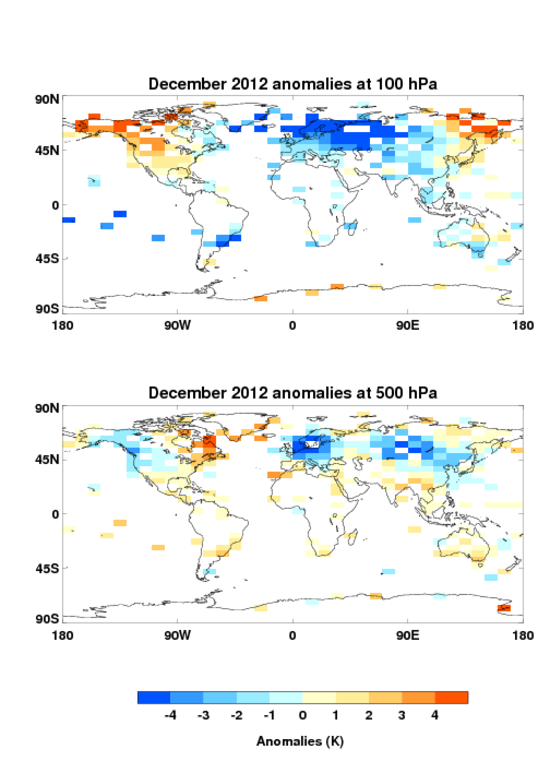 HadAT consists of temperature anomaly timeseries on 9 standard reporting pressure levels (850hPa to 30hPa). The data is also available as equivalent measures to the broad MSU satellite weighting functions. The gridded product is derived from 676 individual radiosonde stations with long-term records. Because of the criteria of data longevity the resulting dataset is limited to land areas and primarily Northern Hemisphere locations. Radiosondes are single launch instruments and there have been many changes in instruments and observing practices with time. HadAT has used a neighbour-based approach to attempt to adjust for these effects and produce a homogeneous product suitable for climate applications. Also see a comparison with Microwave Sounding Unit (MSU) data by Remote Sensing Systems. We have now automated the manual methodology employed in HadAT. This has enabled us to produce multiple data set realisations based on different methodological decisions, and perform a number of complex validation experiments to assess the large scale trend recovery. See the QUARC (Quantifying Uncertainty in Adjusted Radiosonde Climate records) webpage, McCarthy et al. (2008) and Titchner et al. (2009) for more information. Uncertainty analysis - see also QUARC dataset page. Full audit trail of all decisions made in the construction of HadAT. MSU (Microwave Sounding Unit) equivalent measures and their derivation. Papers describing the Quality Control of the NOAA high quality dataset of 87 stations "LKS / RATPAC"